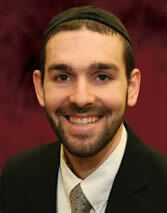 Rabbi Yonatan Zakem is the Director of Community Outreach for the Greater Washington Community Kollel. In that role, Rabbi Zakem will be directing and expanding the Kollel's programming throughout the Greater Washington community. A native of Cincinnati, Ohio, Rabbi Zakem came to the Kollel in 2012 after spending six years in Ner Israel Rabbinical College. While in Ner Israel, Rabbi Zakem received a Bachelors in Talmudic Law and completed a Masters in Education from Johns Hopkins University. Rabbi Zakem’s energy and excitement for Jewish outreach are key ingredients in his ability to inspire and uplift his diverse audiences. In addition to his intense daily curriculum of Talmud study, he teaches a Beginners Talmud class in downtown Washington, and delivers a weekly in depth workshop on the Secrets of Prayer. Rabbi Zakem also leads the Kollel’s Youth Program, where he teaches middle and high school students. In one particularly innovative class, Rabbi Zakem facilitates a spirited discussion with the High School Youth of the community where they explore challenging and thought-provoking cases in Jewish Law. Mrs. Nechama Zakem teaches middle and high school students at the Yeshiva of Greater Washington and also serves as Advisor for the local chapter of Bnos, the national organization for teenage girls.